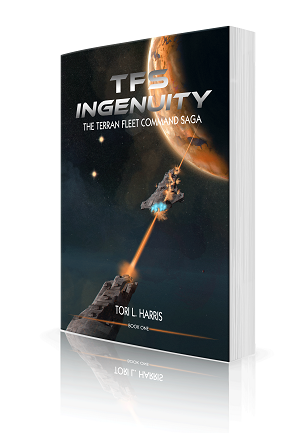 Yesterday (11/13/15) was the first day for "TFS Ingenuity's" new cover design. I really liked the original cover artwork, and plan to still use it in a number of places (like this web site), but I made the change based on feedback from some very experienced authors. You only have a fraction of a second to grab someone's attention on Amazon, so the best covers tend to feature action and bright colors (or, apparently, some dude who looks like Fabio showing his abs). Since I'm pretty sure Captain Prescott doesn't look like Fabio, I went with a battle scene. The cover artwork depicts the end of the battle of Gliese 667 in the story, where the Gresav fires her main energy cannon and destroys her sister ship from the Resistance forces. I think my illustrator, Ivo Brankovikj, did a fantastic job and completed the project very quickly. In any event, I'm crossing my fingers that people like it!